Spray 4- to 5-quart slow cooker with cooking spray. In slow cooker, mix chicken, onions, barley, carrot, garlic, salt, thyme and 3 cups of the broth. In 2-cup microwavable measuring cup, microwave remaining 1 cup broth uncovered on High 2 to 3 minutes or until boiling. Stir thawed edamame and boiling broth into chicken mixture in slow cooker. Increase heat setting to High. Cover; cook 25 to 30 minutes longer or until edamame are tender. Stir in cheese. 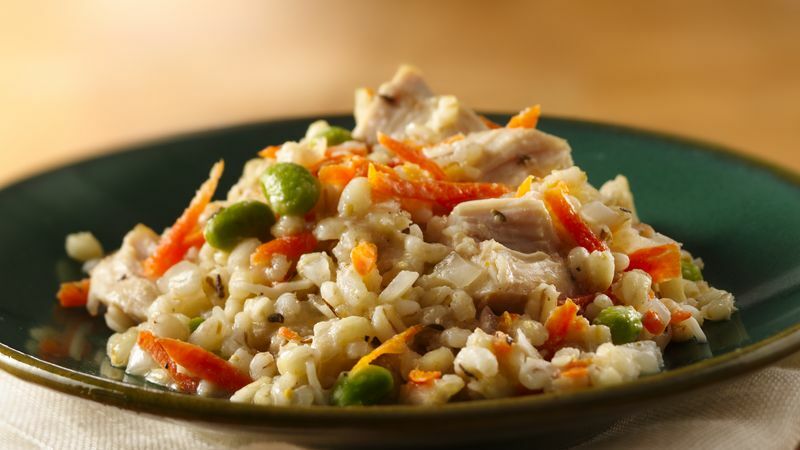 Recipe Variation Vegetarian Barley Risotto with Edamame: Omit the chicken and use vegetable broth instead of chicken broth in this health-packed recipe. Complete the meal with a colorful salad using a variety of greens of different colors and textures.